We are starting the second week of Blogging Marathon #27 and it’s themed on Traditional Dishes. India has so many different cuisines, even in one specific state, we have so many different regions coming up with its own style of cooking. To top this, we also have families that follow their own traditions, cultural specifications as they were told by their elders. There are some recipes that are passed on from grandmom to granddaughter. Recipes that pass over decades and still be relished and cherished. One thing that comes to mind right away is the Tomato Kurma. It’s a dish that my maternal grandmom used to make and Amma learnt it from her. I have such fond memories associated with Tomato Kurma. Right from when I was 10 years old to just recent, when in Ahmedabad, when I made it for my Blogger friends. I was touched when Vaishali’s family liked it so much. After couple of weeks later, I got a call from Vaishali, asking me how I made it. She said her husband had finally given her an ultimatum, that either she makes it or she would get me there! I said she making it herself would be much more economic! Until I heard back from her I was on hooks. I was glad that she was able to make it well. I told her that it was my grandmom recipe and can surely fall under Traditional recipe. Coming to today’s recipe, of course it’s not about Tomato Kurma, even though I realised only when Vaishali told me that the recipe on the blog wasn’t how I made it at her place. That’s for another day! Coming back to the discussion we had when we decided on traditional recipes, it can either be something passed on from your elders or you know something traditional to a region. So for the next 7 days I will be blogging about Traditional recipes, mostly from Amma and Athamma. Couple of them knowing they are traditional recipes. I hope you enjoy this series as much as I have enjoyed cooking them. 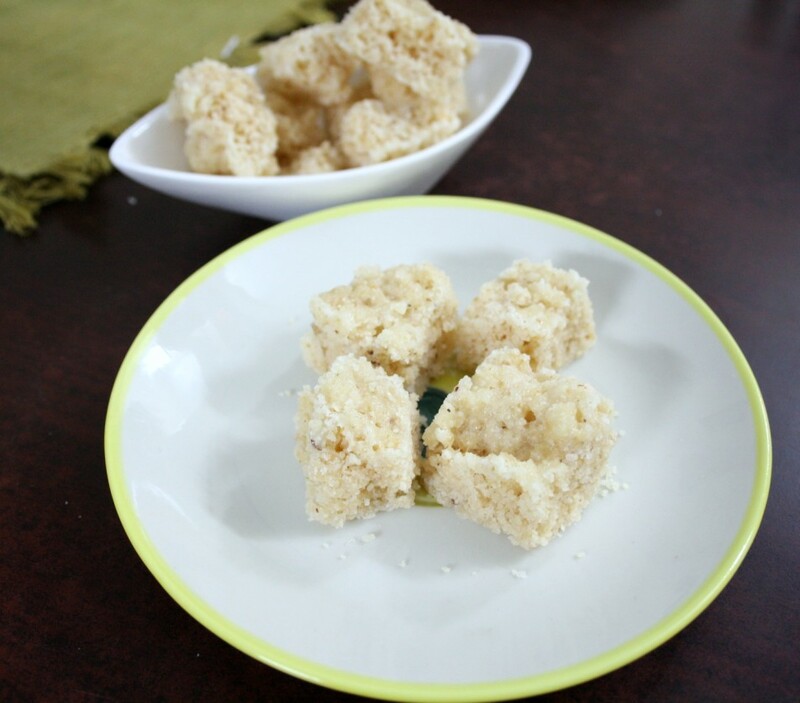 Today’s recipe is similar to the Coconut Burfi that Amma makes for most festivals, especially during Deepavali. Then it turned out to be she was making it each time we end up with leftover Chasni/ Sugar syrup. Her Coconut Burfis are always a hit. The first time I made on my own, was when I met my blogger friends. I was so happy that everybody liked it. Apart from the regular method, she also makes a variation with different ingredients. Though we use rava in a small amount, today’s recipe uses more and tastes different. Heat the ghee in a non stick pan, roast the cashews and keep it aside. In the same pan, roast the rava separately, remove and then roast the grated coconut. In a pan take the sugar, add enough water and bring to boil. Remove the impurities if any. Then continue cooking the sugar, till you get a one thread consistency. Once the syrup researches the thread, add the coconut, rava and mix everything well, sprinkle cardamom powder. When the coconut starts leaving the sides, keep a greased plate ready. Pour the coconut mix into the prepared plate and garnish the roasted cashews on the top and press in gently. Make marks on top and break into pieces once the burfi sets. If you are making in large quantity, you can run it in a mixer too. Chop the coconut into small bits and run them for 1 or 2 rounds in a mixer. It should be coarse. For more taste, you can powder some cashew nuts and add. 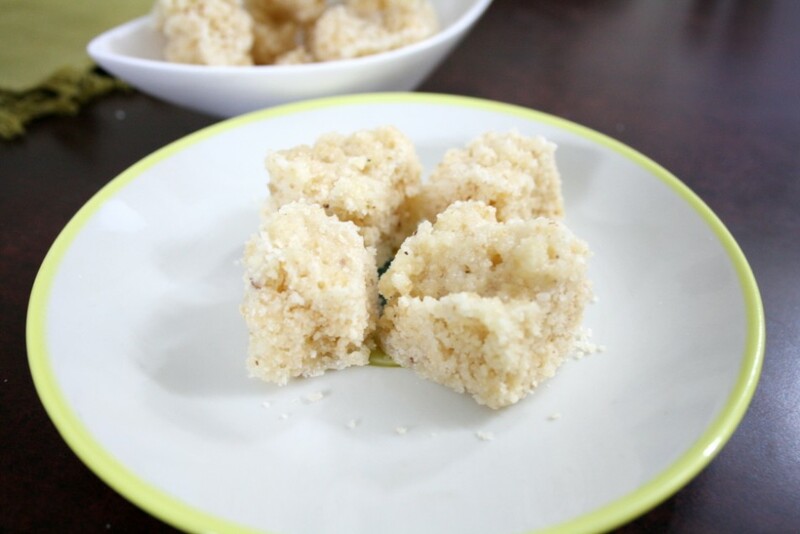 Enjoy this time old traditional Indian sweet anytime of the day! Looks delicious! Love these age old Indian sweets. Coconut rava burfis are my weakness Valli, i can have this beauties anytime, even i can start my day with it. Irresistible Valli. My mom makes these so well that I have given up on making these at home. Moreover I am never satisfied with the quality of fresh coconut we get here! One of the grandma recipe , adding rava is new to me. Absolutely divine . What I will give to have one right now. I want to grab those. 🙂 Never tried the coconut barfi with rava though I have seen my aunt sprinkling besan while making coconut ones. Cuisine changes from region to region and even from house to house. There is no one way of making a dish…The burfis look good and seem easy to make. That Tomato kurma you prepared in A'bad was awesome Srivalli. I wanted to nake it too but still not done. nothing can beat the authentic and traditional Indian Sweet!!! so droolworthy.. we also make this burfi but we do not add sooji! !